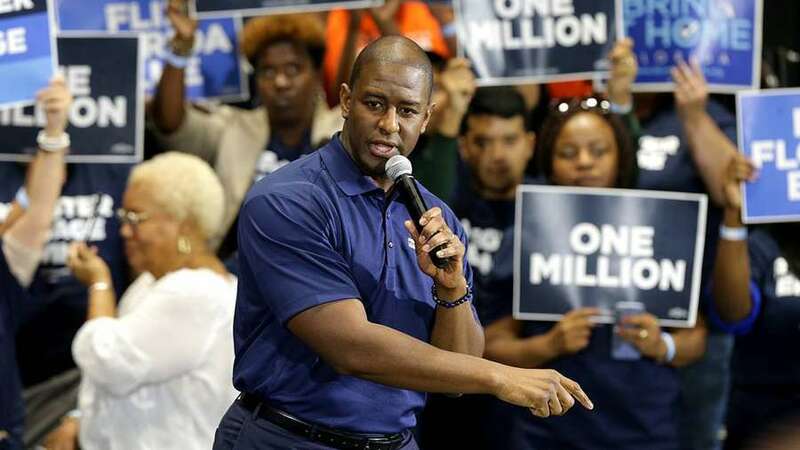 Andrew Gillum came to South Florida Wednesday to launch a campaign that could change the dynamics of the 2020 election — even if he didn’t announce a plan to run for president. At an evening rally at Florida Memorial University’s Miami Gardens campus, Gillum rolled out an ambitious initiative to register one million new voters ahead of the presidential election. The Florida Democratic Party announced that morning that it’s also spending $2 million to register 200,000 new voters. “I’m tapping into that network — what we built from the campaign, the enthusiasm, the volunteers, the infrastructure, the assets there — and trying to turn all of that energy and effort into registering and engaging one million voters in advance of the 2020 election,” the 39-year-old former Tallahassee mayor and past gubernatorial candidate told the Miami Herald. Florida Democrats hope to reinforce a slipping voter advantage in a crucial swing state that voted for Donald Trump two years ago after twice casting its vote for Barack Obama. Over the 10 years from the time Obama was first elected in 2008 to the November midterms, Florida Democrats saw a 700,000-voter lead over Republicans dwindle to roughly 260,000. And that lead didn’t hold up when it came to voter participation this fall when, despite Democratic gains around the country, Republican voters turned out in greater numbers than Democrats and propelled Ron DeSantis to a win of less than half a percentage point over Gillum. So, after receiving plenty of help courting new voters during his campaign from registration-minded political organizations like Tom Steyer’s NextGen America, Gillum said he hopes to build on the enthusiasm that resulted in a roughly 33 percent statewide turnout increase over the 2014 midterms. At the same time, he also wants to do more to reach out to unlikely and unregistered voters around the state, but particularly in places like South Florida, where some party activists felt that the Democratic Party did too little to court Hispanic and black voters in the past election. Miami-Dade County was among the regions where turnout among Democratic voters was low compared to the rest of the state, one of the key reasons Gillum lost the race. He said South Florida remains one of the most important areas for connecting with unregistered and disenfranchised voters. “From a numbers perspective, South Florida is where a heavy percentage of these new voters are going to come from. The population there is one that I think is critical for us when we consider communities largely left out or left behind,” he said. Gillum teased Wednesday’s announcement early this month with a hype video produced by his political committee, Forward Florida, which he says he’ll use to seed a new nonprofit coordinating the voter drive, Bring it Home Florida. The announcement of a coming announcement resurrected speculation that he may run for president. During a guest appearance Friday on HBO’s “Real Time with Bill Maher,” the host and his panelists tried to pry a presidential announcement from Gillum, who, as he has since speculation first began, played coy. Gillum declined in an interview to explicitly say that he isn’t going to run for the party’s nomination in 2020, although he indicated in a New York Times interview that he’s closed that door. He did specifically address one flap in his interview with the Miami Herald over comments he made on Maher’s show about turnout in Florida and Georgia in November. During his appearance, Gillum seemed to question whether the outcome in the governor’s races in Georgia and Florida would have been different “had we been able to legally count every one of those votes.” He told the Miami Herald that he was commenting on the problems that need to be addressed in the way Florida and Georgia validate ballots and handle voter registration and identification. He said he doesn’t believe he was robbed of a win by the state’s laws and policies. “I was talking broadly about disenfranchisement and its impact,” he said.